They are being called hovershoes because they are two mini hoverboards for each foot, and they are totally cool. These hovershoes were originally created by Inmotion, but now several brands have started to manufacture them. Here is what they look like. These hovershoes are very easy to ride, and have the feel of roller skates or ice skates. They are very light, weighing around 6 pounds each, and have a 6 mile range. The added fun and convenience of hovershoes can only be understood by looking at people using them, so have a look at this video. With just a little bit of practice you can master these hovershoes and really enjoy them. Also they weigh only 6 lbs each so are easy to carry. They are also called e-skates. These inMotion hovershoes come with a 1 year warranty. The customer support is also very good, and based in California. Hovershoes comes with a 1-year warranty. You will receive immediate support from our team in California, so you can ride on without worry! These hovershoes by OULV Koowheel are pretty good quality and cost less than the original InMotion ones. They are great fun and have also been made to be more flexible than other models. These shoes have a maximum load capacity of 176 pounds, so you should be careful to buy only if you are 176 pounds or less. They are UL certified for safety and quality, and are powered by li-ion batteries. Their range is 5 miles on a single charge and their top speed is 5 miles per hour. 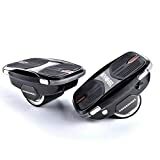 These hovershoes connect to an app which enables you to change the mode to lock or carry, monitor the speed s you ride them and also access tutorials. These shoes also have Led lights that can be changed through the app. Overall the Koowheel Hovershoes are stable and compact and perform well. The Hoverclub Hovershoes are UL 2272 certified and are reasonably priced. They are well designed and feature a 10 mm rubber bumper around the periphery to prevent rider injury. Each Hoverclub Hovershoe has a 250 watt brushless motor, and drums a maximum speed of 7.5 miles per hour. On a full charge the hovershoes can travel up to 6.2 miles. The footpads are textured to give excellent grip, and each weigh only 3.3 kgs. The load these shoes can operate with is 220 lbs. Charging time is just 2-3 hours for a range of 6,2 miles or 10 kilometers. These Hoverclub Hovershoes come with a 1 year limited warranty. There is a reason why these LED Light Up Flashing shoes are also being called hoverboard shoes. They are a great combination with your hoverboard, especially at night when you need more visibility from other people or other vehicles. The Top 10 Hoverboard Shoes LED Light Up Flashing Sneakers are the most popular of their kind that have been bought online by customers. Hoverboard shoes are great even when you go out for a social gathering or just a walk with friends in the evening. Now along with the led light up hoverboard shoes of the soles, we even have the entire shoes lighting up with led lights. Check out the number one bestseller in the list below. These shoes have LED lights on the soles which light up in several colours and also come in a several flashing combinations. These shoes were originally designed by a shoe designer pair going by the names of Yifang Wan and Samuel Yang. Samuel Yang graduated from the Central Saint Martins College of Art just in 2013, and is already a world famous designer. Yifang Wan is also a graduate of Central Saint Martin MA, and is a world renowned minimalistic designer. They came up with the shoe brand Simulation featuring these LED light up shoes in a minimalist style. More about the original Simulation sneakers later, let’s get back to the best hoverboard shoes, the LED Light Up Flashing sneakers. These shoes have Led lights embedded in their translucent soles, which light up on pressing a switch on the inside along the inside hem of the shoe. Pressing this switch will bring on several different colors first, and then will get into a few flashing modes. On most of these shoes you need to press nine times to switch off the lights. The first 7 times, the color of the LED lights change, on the 8th press, the lights change mode to auto lights changing, and on the 9th press the lights go off. There is no need to worry about replacing any batteries in the shoes as they are charged through a USB port. The shoes come with a USB charging cord that can be plugged in into each shoe through a small port close to the switch that turns them on. So you can basically charge your shoes with your laptop. 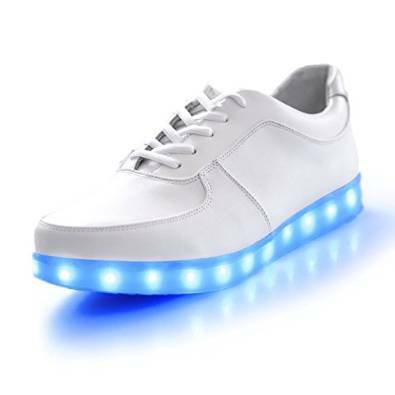 The original Simulation LED shoes by Yifang Wan X Samuel Yang come for a hefty $500 to $700, but there are innumerable spin-off LED Light Up shoes that are available online, right from AliExpress to eBay to Amazon, in the price range of $20 to $60. 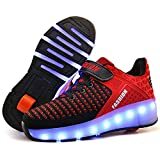 Buy LED Light Up Sneakers from Amazon – Our strong recommendation. These shoes are literally flying off the virtual shelves from AliExpress, eBay and Amazon, but our recommendation is to buy them from Amazon. The price is higher on Amazon, but there is a standard 30 day refund policy that is well worth it. Many people who have bought these LED light up shoes have seen them malfunctioning within a few days. Mostly the light strips stop functioning properly, with some or all the lights going off permanently. Thus putting in a little more money and buying them from Amazon will be a better route to go. The original ones are well over $500 and have a very minimalistic look. They have been created by the shoe-designer duo Yinfang Wan and Samuel Yang. Yifang Wan is a young designer who specializes in womenswear and is from Japan. She has a distinctive minimalist style with clean lines and influences from sculptural shapes. She has already won amny awards including the L’Oreal Professional Award for Young Talent. Samuel Gui Yang is China born but a London based designer who also specializes in womenswear. Instead of the list, if you want to see a video of the Top 10 Best Hoverboard Shoes, then take a look below. They are the rage now, hoverboard shoes, also called the LED Light Up shoes or the flashing sneakers. Don't for a moment think of the shoes you wore when you were a toddler that would light up when you walked. These are seriously bright and versatile light up shoes. There is a row of LED lights embedded inside the rubber soles of these shoes, and they have a usb port to charge the shoes. You can charge them through your laptop too. They take about an hour plus to fully charged, but then they are good to go for eight hours. They'll last through your party and also make you the center of attraction. You can check out the most popular Hoverboard LED Light Up shoes from this list of the top 10. They are all durable, good quality and stylish. Since you will be buying them from Amazon, there will be added reassurance of Amazon’s refund and return policy. You can read more about these shoes here. Gary, who is a DJ, and lives in Austin, is quite fond of hoverboard LED shoes. He already owns a hoverboard, a Skque UL 2272 self balancing board, that he says is quite good, and he now owns several pairs of hoverboard light up shoes to go with it. Since he is a DJ he gets a chance to show off his hoverboard light up shoes almost every night and occasionally when the opportunity arises, he does the double light up show – rides his hoverboard with hoverboard shoes on. It has been some time since he bought his first pair of hoverboard shoes, and now he is a full fledged fan. Here we bring you Gary’s choice of the best Led sneakers to buy today. Actually it is not just for a DJ like Gary to wear light up shoes while riding hoverboards, many people are doing it and looking quite awesome too. You too can wear your hoverboard Led sneakers and ride to a a park or even to your next class. The best combination according to Gary is to put on a combination of the Led sneakers and whizz by with the LED lights of his Skque hoverboard blazing. It always makes him the center of attraction and begins a load of conversations, “even with pretty girls”, as he himself says. Though we are calling them hoverboard shoes, they are known by several names including Led shoes and light up shoes. Today the price of these hoverboard shoes have really dropped and there plenty of options, most of which deliver good quality. Many night runners also prefer these shoes as they make it safer for them. We have rounded up the best hoverboard shoes according to Gary and put them down for you so that you can find that perfect pair. 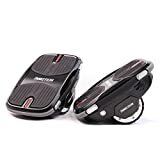 The great thing about the Odema Hoverboard shoes is that they are clean and minimalistic quite like the original design that made them famous. These shoes are priced at an affordable range, and are made from PU leather that mimics real leather at a much lower price. With the shoes rising near the ankles, these high top LED shoes have seven different colors and several lighting modes. There is a hidden switch just near the top eyelet that lets you programme the lighting from a solid color to alternating colors to no lights on. As is the case with all hoverboard shoes, the Led lights are powered by a small battery that is charged by a USB cable. This cable can be connected to your laptop or any other USB power port. As for the shoe, the charging port is hidden towards the inside, and does not cause any discomfort at all. The cable splits into two enabling simultaneous charging of both shoes. 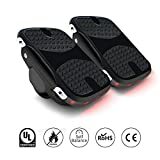 Another great feature of the Odema hoverboard shoes is the no slip sole that makes it great for riding your hoverboard, dancing running or performing. Gary feels that the Odema shoes are comfortable and look great, and are one his favorite pairs. Truly high tech in the world of light shoes, the MOHEM ShinyNight High Top LED Light Shoes has the option to change up to 16 static and 4 dynamic colors via a wireless remote. The remote also allows you to regulate the brightness, and switch between color effects such as flash, strobe, fade, smooth and turn the LED lights on or off. Made of PU leather and a comfortable rubber sole, the shoe is fitted with a USB charging port (with cable) and a control switch in case the remote is not at hand. The shoes are available for the whole family, in sizes for kids, women and men. These shoes are great for a night out or an evening of skateboarding and hoverboarding in the park. The Joansam LED Sneakers Hoverboard Shoes stand out from the rest due to their unique design and breathable cotton-blend uppers, making the shoes extremely comfortable. The LED light color options, controlled by a switch in the shoe, can be displayed either in a steady mode or in a light changing mode, going through each color. The rubber sole has the exciting feature of 360 degree LED lights! The shoes come in a dual- tone pattern that go in tandem with the lights. Available in designs for men and women and unisex sizing, Joansam shoes are currently not available in kid sizes. Available in a trendy paint splatter print on the PU leather shoe, the LeoVera LED Hoverboard Shoes are available in unisex sizes for both men and women. Do take care though that the shoes run on the smaller size, so order 0.5 – 1 size larger than your usual size. The LED lights in the rubber sole glow in seven colors and can even rotate in design. The LED lights are white, purple, yellow, blue, green, light blue, red. Fully charged at 3 hours via a USB cable, the lights will be active for upto 10 hours.